This artist's concept shows how high-speed jets from a supermassive black hole would look. A newfound giant black hole nearly as massive as 7 billion suns is dozens of times larger than astronomers expected given its host galaxy's size, researchers say. This finding may call most current models of galaxy formation into question, scientists added. This black hole, one of the largest ever seen, formed in the early universe about 11.7 billion years ago — 2 billion years after the Big Bang. The very fast motion of gas near the black hole suggests that it has a very high mass — the equivalent of about 7 billion suns. The discovery was unexpected. "Our survey was designed to observe the average objects, not the exotic ones," study co-author C. Megan Urry, of Yale University, said in a statement. 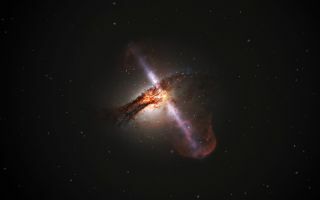 "This project specifically targeted moderate black holes that inhabit typical galaxies today. It was quite a shock to see such a ginormous black hole." However, it was the mass of the galaxy surrounding this black hole that most surprised the research team. "The measurements correspond to the mass of a typical galaxy," study lead author Benny Trakhtenbrot, an astrophysicist at the Swiss Federal Institute of Technology in Zurich, said in a statement. "We therefore have a gigantic black hole within a normal-size galaxy." Most galaxies, including the Milky Way, possess at their hearts a supermassive black hole with a mass ranging from millions to billions of times the mass of the sun. The supermassive black holes seen up to now usually make up only 0.2 to 0.5 percent of the mass of their galaxies — far less than CID-947 does. "The black hole has roughly one-tenth of the mass of the host," Trakhtenbrot told Space.com. "The black hole is massive compared with the normal host galaxy." The result was so surprising that the astronomers had outside experts verify their results independently. Current models of galaxy formation suggest that galaxies and their supermassive black holes evolve in sync, growing at the same rate. However, CID-947 defies this rule, precociously growing much faster than researchers would have predicted. "The black hole and the galaxy were not growing in parallel, as many models would suggest," Trakhtenbrot said. In addition, the scientists found that, although the black hole had reached the end of its growth, stars were still forming in its galaxy. Prior research suggested that radiation and flowing gas from around the black hole would stifle the birth of stars. "The black hole didn't affect the growth of the galaxy — again, contrary to many common models and ideas in the field," Trakhtenbrot said. "The black hole has done most of its growth and is shutting down. The galaxy is still growing." This finding supports previous research suggesting that black holes may have grown incredibly rapidly in the newborn universe, Trakhtenbrot said. For instance, the early universe was much smaller, and thus denser, on average than it is today, which could have helped black holes back then gorge on "an almost continuous inflow of gas without 'burping' too much of it back into the galaxy," Trakhtenbrot said. Trakhtenbrot and his colleagues now want to analyze more similarly ancient supermassive black holes to learn more about their interplay with their galaxies. The results appear in the July 10 issue of the journal Science.